£1.1 billion was spent on decommissioning in the UK in 2015, accounting for 5% of total UKCS expenditure that is expected to increase to 12% in 2017. Oil & Gas UK has estimated that decommissioning on the UKCS up to 2025 represents a £17.6 billion opportunity. With the UKCS accounting for 50% of the global decommissioning spend over the next 5 years, the North Sea is at the forefront of developing the techniques to optimise the process and could position itself as a major player in the global decommissioning industry. At a recent conference on the subject hosted by Edison, together with Addleshaw Goddard, the key themes of cost uncertainty and industry collaboration emerged. The overall cost of decommissioning is still subject to large uncertainties, with the estimated cost now 6 times greater than it was a decade ago. With 94% of the 153 existing UKCS projects in the early planning stages of the process, current figures will change as these projects are refined and this uncertainty is a possible deterrent to new entrants to the basin. In recognition of this, the newly created Oil and Gas Authority (OGA) is working to provide its own estimate of the total cost by the end of 2016, and is also looking to provide effective cost benchmarking to operators during 2017. A successful decommissioning project should be carried out at the lowest cost while ensuring a safe and environmentally responsible solution. This is different from the schedule and quality driven capital investment projects that the industry is used to dealing with and requires a change of mindset from competitive to collaborative. (P & A), at 47% of the total cost on average. It is estimated that 1,470 wells will be P & A'd between now and 2025 and operators are trying to find ways to minimise the cost of their P & A programmes. In the Southern North Sea a number of operators are looking at decommissioning their assets in batch campaigns to optimise the use of rigs, vessels and accomodation in the most cost effective manner. But, in a sign of the beginnings of a shift to more collaborative behaviours, some operators are considering the benefits and risks of carrying out these campaigns on a cross operator basis, with the potential to bring continuity and cut costs further. The industry is aware that collaboration has been historically poor and that this must improve to meet the challenges of decommissioning. The presence of the OGA, with its focus on MER UK (maximising economic recovery) should help in achieving this, but only time will tell if the industry can effectively change its behaviours. The total shareholder returns of the majors outperformed the NY industrial average since 2000-2016 buoyed by the Chinese supercycle and resulting oil prices. However, the total returns seen by investors have lagged badly in the last decade, as inefficient capital bases in a newer world of higher costs and moderating/falling oil prices dragged on returns. At the beginning of a new oil cycle it is right to examine how companies fared in the previous cycle and see what they may do in the next. In this post, we look at returns made by the majors and how these compare to the WACC. Since 2006, the majority of companies have produced below-WACC returns, and as the chart below indicates, only Exxon has averaged above cost of capital returns over the last five years. This compares to stronger returns from 2000-2008. We believe this was primarily due to the sharply increasing oil prices during that time co-inciding with a capital base built on sub $20/bbl oil. It was only as costs increased the returns turned below WACC and have been consistently below since 2008. As the tide moved out in 2014-2016, the majors were exposed as modestly clothed. Companies will have to take proactive steps, especially in the lower oil price environment, to increase these returns to at least above WACC if they are to maintain their value and investor base. Many have taken writedowns which reduces the capital base, but we expect additional work will have to be done to increase post tax operating profits. This can't be achieved purely through cost cutting. If we assume this is achieved purely through new projects introduced into the capital base, this means new projects will have to make sharply higher returns to re-balance this picture. What returns will new projects have to achieve? In the analysis below, we assume the companies will move from average ROIC (20012-2015) towards WACC through four years of investment. This indicates that any new projects will need to achieve returns of 11-17% on average. How does this effect E&Ps? If the company funding your project requires a return of X% for its investment, then X% is the marginal cost of capital for the seller. If the majors (taken here as a proxy for industry as a whole) will be more stringent in investment decisions, it therefore follows that the cost of capital suffered by E&Ps in need of funding will (structurally) rise. This needs to be more fully reflected in the discount rates used to value E&P companies in search of capital. How long does it take to develop a new discovery to first production? The answer will of course vary greatly and depend on a wide range of factors, from the size of the accumulation, to the maturity of the basin and the presence or lack of existing infrastructure. But in many cases the time taken will probably be longer than originally anticipated. The recently published Oil & Gas UK economic report contributes some interesting statistics on this subject from a UK perspective. 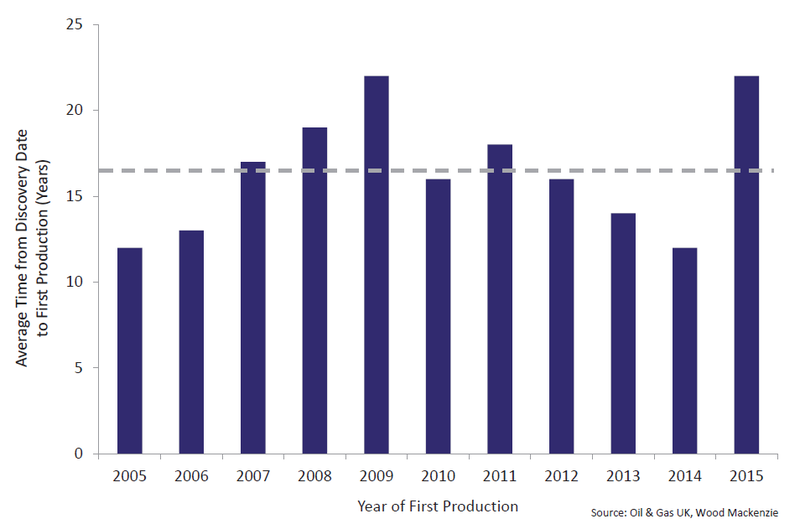 In the North Sea, the current average is 17 years (for those fields entering production since 2005), with all developments during this time taking more than 10 years. This is a lengthy payback time for both operators and investors. For a mature basin such as the North Sea, these numbers are somewhat misleading since discoveries are often considered uncommercial when originally drilled but can become more attractive later due to the application of new technology, access to new infrastructure or an improved economic environment. For example, the Kraken heavy oil field was originally discovered in 1995, but it wasn't until Nautical Petroleum drilled an appraisal well in 2007 that a development looked commercial. Current operator EnQuest expects first oil from Kraken in 2017, though it is worth noting that this will be five years later than the 2012 onstream date that was assumed after the success of the first appraisal well. The record for a UKCS oil development is the 85 days achieved by TAQA in tying back its 2012 Cormorant East discovery to the North Cormorant platform. This is an impressive achievement, but ultimately only possible because TAQA was operator of both the discovery and the host facility. EnQuest's Scolty/Crathes were discovered in 2007 and 2011 respectively and are due onstream by the end of 2016. The field will be tied back to the Kittiwake platform, facilitated by EnQuest acquiring 50% and becoming operator of the Greater Kittiwake Area in 2014. Without this level of control, tie back developments tend to take longer. Serica Energy discovered the gas condensate Columbus field in 2006, but has been unable to agree commercial terms with the operator of the Lomond Platform less than 8km away. Even those accumulations that look attractive straight away as stand alone developments can take many years to come onstream. Chevron's 240mmboe Rosebank, one of the largest undeveloped fields in the region, was expected to be onstream within 7 years of its discovery in 2004, but it has yet to be sanctioned, partly because the project sits in the under developed West of Shetland region and requires a new gas pipeline. Successful stand alone projects tend to take at least six or seven years from discovery to first oil, with Buzzard, Golden Eagle, Foinaven and Huntington all in this timeframe and to be joined by EnQuest's Catcher if it comes onstream as planned in 2017. More technically challenging fields are likely to take longer. Maersk's HPHT gas condensate Culzean field is due onstream in 2019, eleven years after discovery. The Mariner heavy oil field is also due onstream eleven years after current operator Statoil took over the asset in 2007 (although the field was discovered in 1981). In less mature Norway the average lead time for an individual discovery is still 11 years and up to 15 years is not uncommon. Offshore West Africa, the development timelines are shorter with the majority taking between 7 to 10 years, but can range from 3 to 16 years. When a discovery is made, the temptation is to believe that this is the project that will be developed within the most optimistic historical timeframe. It would be more prudent to assume that it will not. Rockhopper (RKH) holds a material stake in the major discoveries in the Falklands. The Sea Lion complex holds 517mmboe of 2C contingent resource (900mmboe 3C), while the Isobel Elaine complex could be a similar magnitude (according to management estimates). This resource base (over which RKH holds a >50% working interest) is significant on a global scale and commercially attractive given the cost reductions achieved through the FEED process so far – the project is NPV10 break-even at $45/bbl. Although the timing of project sanction is uncertain (particularly given the financial constraints of its partner PMO), the fiscal regime and resource base makes this a compelling long-term project. Our revised core NAV is 74p/share. The Sea Lion complex is an important discovery and one of the largest undeveloped fields globally. A combination of political constraints, low oil price and financing issues has meant a slower development timeline than hoped, but this does not diminish the resource in a well appraised, well understood reservoir. With an extension of the licence to 2020, PMO/RKH have time to find the best development arrangement with potential partners and a recent thawing in the political climate gives us hope that a wider range of partners may be interested. Funding an initial development of c 220mmbbl (with pre-first oil capex of $1.5bn gross) opens up fully funded exploitation of the resource and significant value. Evolution in the production base over the last year (Civita start-up, successful Guendalina side track and Egyptian acquisition) has given a solid cash flow foundation that should largely cover G&A while giving potential exploration upside (from wells at Abu Sennan and El Qa’a Plain) in 2017. RKH is therefore well-funded to see it through to the development stage of Sea Lion Phase 1. We have revised our core NAV to reflect our uncertainty on project timing (we now assume first oil in early 2022) and commercial terms, as well as moving to a 2017 valuation date and increased discount rate. With our assumed long-term oil price of $70/bbl, the development of Sea Lion will create significant free cash flows and value. A material move toward sanctioning the project (perhaps by the introduction of a new partner or financing structure) has the potential to increase this markedly, while firming up of Isobel Elaine complex volumes could add materially in time. Rockhopper is a London-listed E&P and a major holder in the significant discoveries in the Falkland Islands. The Isobel Elaine complex discovery has the potential to match the 517mmboe 2C resources currently ascribed at the Sea Lion complex, although further appraisal drilling will be required to confirm this. If proven up, it would leave Rockhopper with a >50% working interest in around 1bnbbls of resources with attractive fiscal terms. FEED for Phase 1 of Sea Lion (of c 220mmbbl) is well advanced, with major contractors able to generate material cost savings in the current oil price environment – capex to first oil is currently expected to be $1.5bn (vs $1.8bn previously), while we model a life-of-field opex rate of $25/bbl (vs $30-35 previously). Phases 2 (Southern part of Sea Lion and additional Sea Lion complex reservoirs) and 3 (the Isobel Elaine complex) will more fully exploit the resource base. Given the $45/bbl NPV10 break-even and attractive tax and royalty terms, the project should benefit from a firming of oil prices that many expect in the long term. Certainly, the phase one project returns are attractive (IRR of c 25% in 2017 at the forward curve, and 40% with our long-term assumptions of $70/bbl real). However, there is a risk of slippage to the project. Although the project is NPV10 break-even at $45/bbl, industry should require a notably higher return than 10% to give the go-ahead, and we expect that a strengthening of the oil price (or lower costs) will be required for project sanction – something that the forward curve implies is not likely in the near term. Premier’s financial position has been under scrutiny in recent months and it is currently unable to finance the >$1.2bn (net) required to first oil, so a project sanction pre-2018 may be dependent on a third party entry to the project. On top of this, the carry arrangement with Premier (PMO) means its economics of NPV10 break-even are slightly higher than RKH’s at $48/bbl (according to our modelling). Balancing these factors is the enormous NPV to which a full exploitation of the resource would lead for those involved in the project. Although an earlier production start-up is very possible if FID is reached quickly, we model first production in 2022 to factor in a delay. Even modelling this relatively late start-up, the unrisked project value for Phases 1 and 2 (combined) is above $4bn (@ 10% discount rate) or $2bn (@ 15% rate), and Phase 1 cash flows should largely fund the capital investment in further phases. Gross peak volumes considerably above 100mb/d should be possible even without a development of Isobel Elaine complex (and ignoring the potential 3C upside in Sea Lion). As a result, we believe management of both Premier and Rockhopper are open to approaches to get the project sanctioned. Elsewhere, the acquisition of the Egyptian assets from Beach Energy should provide steady, low-risk cash flows that, when combined with cash flows from Italian gas production should broadly offset G&A expenses. Furthermore, the portfolio contains a number of exploration targets that could add longer-term value (incremental exploration targets at Abu Sennan, a committed exploration well at El Qa’a Plain in late 2017, and Monte Grosso in Italy could be drilled under ENI’s operatorship). The Falklands remain the core of the value for investors in Rockhopper. Although the timing and commercial arrangements that will eventually see Sea Lion’s first production are unclear, the exploitation of a 500mmbbl discovery with good fiscal terms means development is surely inevitable in time. However, the current low oil prices and investment appetite in the industry mean we assume a delayed FID (vs previous thoughts) and first oil in early 2022, while uncertainty on commercial terms under which development will occur means we have lowered our risking. These changes, together with consolidation of the Beach Energy assets and a move to a 2017 discount year, lead to a revised core NAV of 74p/share (from 93p/share), using a 12.5% discount rate. This would fall to 56p/share at a 15% discount rate (and 34p at a 20% rate). Cash flows from Italian gas production and Egyptian oil production should be enough to largely offset administration expenses, enabling management to focus on its use of the remaining c $60m cash that we expect it to have by end 2016. Availability of capital to develop Sea Lion is key among the considerations, although minor expenses in exploration in Egypt, and possibly in Italy, will need to be catered for. The existing development carry with Premier implies that RKH will need to find more than $250m to get to first oil in Phase 1 assuming current cost assumptions. While our base case is that this will come from the loan arrangement with PMO as a backstop, other (cheaper) sources should be available (the bond market and later a reserve-based lending facility as production nears) – though given our current assumption of first oil in early 2022, there is plenty of time to arrange alternative sources if required. The overriding factor in the valuation of Rockhopper is the timing of the development of Sea Lion. Although the project break-even (NPV10) is $45/bbl, project sanction is more dependent on PMO’s higher NPV10 break-even (which we calculate as $48/bbl) and its financial position, which may not improve towards an acceptable level (net debt/EBITDA of <3x) until 2018. The resulting time to first oil (of five to six years) reduces unrisked value materially and makes it more sensitive to increasing discount rates. A 2.5% decrease in the discount rate (from our assumed 12.5%) increases Phase 1 NPV by c 25% – we would expect the effective cost of capital to decrease as the risk of the project reduces as production nears and ramps up. The uncertainty on project sanction also leads to uncertainty on the exact commercial terms at which Rockhopper will participate in the project. Given the size of the prize, it makes sense for the company to take a view on sacrificing some working interest/value (as it did when the development carry was renegotiated and split between phases 1&2) if it means a faster project sanction and first oil. This is equally true of Premier (if not more so given its financial situation). Once up and running, cash flows should benefit from increases in oil prices. For Phase 1, our modelling indicates that a $5/bbl increase in Brent oil price would see NPV12.5 rise by c 15% (although we would estimate that accompanying cost inflation in this scenario would dampen this). Independent Oil & Gas(IOG) drilled its Skipper appraisal well in August this year, but despite initial indications that the heavy oil was moveable in the reservoir, the company has now announced that sample analysis points to a significantly higher viscosity than expected, forcing a rethink on potential development options. Skipper sits in a heavy oil prone region to the south of heavy oil fields Bressay, Mariner, Kraken and Bentley and is estimated to contain 2C resources of 26.2 mmstb. The key uncertainty prior to drilling the appraisal well was the viscosity of the oil, so the primary objective was to recover good quality reservoir samples from the well. Viscosity is seen to be a more useful indicator of flow properties for heavy oil fields, and a higher viscosity than expected would require different processing considerations and a higher well density. The discovery well, 9/21-2, was drilled in 1990 but failed to flow on test. Samples recovered from the well indicated the oil was 14 - 16 deg API, but uncertainty remained regarding the viscosity of the oil, since the samples were dead oil and there was no representative pressurised sample from the well. These samples indicated a dead oil viscosity of 750cP, which was considered to be pessimistic and taken as the low case for the well. In the 2013 CPR the oil viscosity at saturation pressure at reservoir conditions was then calculated, using a range of correlations, to be 160cP in the mid case. A viscosity of 160cP would have put Skipper alongside Captain, the only heavy oil field producing in the North Sea to date and Kraken, due onstream in H1 2017. First sample results indicate that the oil is heavier than expected at 11 deg API and that the viscosity is significantly higher, though no actual figure is given. Although a higher viscosity would make a development more challenging, such oil can still be developed, with Statoil going ahead with the 508cP Heimdal reservoir in Mariner and Xcite demonstrating that commercial rates could be achieved in the 1500cP Bentley when it produced from the 9/03b-7 well at up to 3,500 bopd through an ESP. Both Bentley and Mariner are however significantly larger than the 26mmbbl Skipper. Mexico's Secretary of Energy, Pedro Joaquin Coldwell, indicated in a speech in Houston last week that the country's first auction for its northern shale fields, delayed because of low oil prices, could now take place as early as Q2 2017. According to an EIA assessment report carried out in 2013, Mexico holds technically recoverable resources of 545TCF of shale gas and 13.1blnbbls of shale oil and condensate. The bulk of this sits in the Eagle Ford Shale of the Burgos Basin which is estimated to contain 343TCF and 6.3bnbbls. Since the reservoir in Burgos is an extension of its commercially successful equivalent in South Texas there are hopes that the US fracking successes can be repeated here. In the basins to the south and east of Burgos the shale geology becomes more complex and shale development potential is less certain. National oil company Pemex began exploring for shale oil and gas in 2011, but early wells have been expensive with reported costs of $20-25m per well, three times the cost of a Texas Eagle Ford well. Rates have also been modest at 2 -3 mmscfd. With some wells located close to successfully producing Texan wells, it should however be possible to increase these rates through operational improvements. Mexico needs access to technology and financial resources in order to fully exploit its shales resources and hopes to achieve this through its ongoing energy sector reform, including the auction process. Despite the geological similarities with Texas, there are further issues that will complicate shale gas extraction in Mexico. The Burgos basin sits in an arid region of Mexico, so that ensuring a supply of sufficient water to carry out fracking will be challenging. Finally, security is a major issue, with the basin sitting in an area of organised criminal activity. This activity includes the illegal tapping of pipelines, with incidents expected to exceed 4000 this year, up from 710 in 2010. For the first round, the Mexican government have selected areas where the cartels are not as dangerous, but the stituation will need to be tackled for large scale shale development to succeed. This week, the company provided details of the results of the appraisal campaign as part of its half yearly results. The successful programme boosted 2C resources by 43% from 330mmbbls pre campaign to 475mmbbls and established flowrates of between 5000bopd and 8000bopd across four separate DSTs in two wells. Uncertainty still remains however, particularly around the connectivity of the upper reservoirs and investigating this further will be a priority for the next phase of drilling planned for late 2016/early 2017, when the company intends to drill two more appraisal wells, with multiple options for further wells. Good quality reservoir has consistently been found across SNE, though the lower reservoirs are described as being better quality than the upper reservoirs. The upper reservoirs are finer grained and slightly thinner and, during testing of this zone, a slight pressure depletion was seen indicating that connectivity is not as good here. Since a greater part of the gross volume is known to be in these upper reservoirs (though Cairn has not specified in what proportion), the next phase of appraisal will be designed to gain a greater understanding of the connectivity here. The upper reservoirs currently have a lower recovery factor (RF), so most upside is likely to come from improving the RF in these reservoirs. Key to this will be the ability to waterflood as many of the upper reservoir layers as possible. The upcoming appraisal will include interference testing to further understand connectivity and the likelihood of being able to achieve pressure support through waterflooding, and pressure gauges have already been installed in two of the four existing appraisal wells for this purpose. Cairn also provided an update to its resource range for SNE. Following the SNE-1 discovery well, the company estimated the 1C-2C-3C range to be 150-330-670 mmbbls. The most recent estimates have been independently prepared by ERC Equipoise and are now 274-473-906mmbbls. The uncertainty range has therefore increased post drilling, but with a shift to the upside. Looking at the change in STOIIP between the SNE-2 and SNE-4 appraisal wells, we can see that the 3C figure remains virtually unchanged, so that the increase in the upside estimate is driven by being able to increase the RF. Cairn's estimate is more conservative than that of its SNE partner, FAR Limited. FAR's estimate of gross resources was independently assessed by RISC at 277mmbbls 1C, 561mmbbls 2C and 1071mmbbls 3C. We do not have sight of FAR's STOIIP figures, however we expect that the difference between these figures is most likely to be as a result of using a slightly higher recovery factor. SDX Energy (SDX) is a London/Toronto-listed company with interests in two producing onshore fields in Egypt. Crucially for a small E&P, it will be cash flow positive in 2017 and is unlikely to return to the market for more equity to develop assets. The current work programme (of new wells, workovers and water flood) could see a more than doubling of recoverable volumes and is both cheap and relatively low risk. Once this work starts to bear fruit (later in 2016/17), the low-cost production will put SDX in the enviable position of being able to largely fund development of exploration prospects, while giving it resources and operational credibility to add further assets in Egypt. Our analysis indicates that the share price is more than supported by current operations, giving upside potential for the near-term production increases we see as likely and free exposure to exploration upside. SDX’s plan to change pumps and institute a water flood at Meseda (50% WI) should take production to over 8mboe/d (gross), while US$8m gross investment at NW Gemsa (10% WI) could see it maintain production for a year or more. After this, the fields should produce free cash flow, even down around US$30/bbl in 2017. This cash flow generation and operational expertise gives the management options. Material, near-term (carried) exploration drilling at South Disouq is targeting 65mmboe of gas/condensate, which would lead to a re-rating for investors if successful. SDX holds a high working interest (55%) and development would likely be low cost and quick (the asset lies close to existing infrastructure). Our analysis indicates the shares are supported by existing production. Successful re-invigoration at Meseda/NW Gemsa should lead to unlocking further (low-risk) value. Our core NAV of 41p/share includes risked value for the reinvigoration programme but could see further upside (to 56p/share) if the water flood programme is effective (not including risked exploration value at South Disouq). Value from any acquisition(s) will hinge on the size/price and possible upside of the targets, but SDX should be well placed to take part in consolidation within Egypt given the large number of opportunities in-country. Its policy of accepting payments in Egyptian pounds reduces payment risk and funds internal growth in the mid-term, but could limit potential for dividends/other corporate activity in the longer term. The Porcupine Basin is an exploration hotspot, driven both by the interest in Jurassic plays similar to those found in the analogous Flemish Pass basin offshore Canada and in Cretaceous stratigraphic prospects similar to those encountered offshore West Africa. As such, the 2015 Atlantic Margin licencing round has been the most successful to date, with a record number of 43 applications from 17 companies. With Phase 2 of these awards announced in June 2016, we are providing an update to our Exploration Watch on the Porcupine basin published in April 2016. For a more detailed introduction to the basin, please refer to our original note. While a significant number of the Phase 1 awards went to majors interested in the Southern Porcupine Basin, the 14 licence options awarded in Phase 2 have gone to 11 independent companies. Concentrated to the north of the Phase 1 awards, a number of Phase 2 licences have been awarded away from the basin edges and with a separate area of interest appearing around the Corrib gas field in the Slyne Basin to the north-east of the Porcupine Basin. Europa Oil & Gas was awarded four licence options and AzEire and Petrel Resources received two, with the remaining eight companies picking up one licence option each. A number of companies have entered the Atlantic Margin for the first time, including Faroe Petroleum, Predator Oil & Gas, Theseus and Ratio Petroleum. The work obligations for these awards mainly involve desktop studies and so offer a low-cost entry to the area for small independents. The licence options terms vary between two to three years before a company must decide whether to convert to a frontier exploration licence (FEL) and commit to more expensive activity such as 3D seismic acquisition and exploration drilling. The Phase 1 awards were allocated earlier in the year to companies with firm seismic acquisition plans and this has allowed some surveys to be carried out over the summer seismic window in 2016. Woodside has already completed a 1,600km2 3D survey over its LO 16/14, known as Granuaile, in the Southern Porcupine Basin and covering blocks 54/11, 54/12, 54/13, 54/16, 54/17 and 54/18. 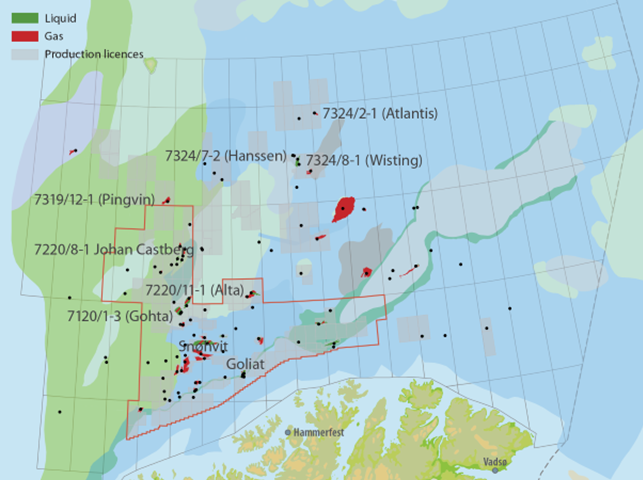 The company has now shifted its attention north and is in the process of acquiring 2,400km2 3D seismic across an area known as Bréannan, covering its licences FEL 3/14 (in which Petrel holds a 15% WI) and FEL 5/14 (with partner AzEire, 40% WI). In addition, Statoil and ExxonMobil are expected to carry out a 5000km2 3D survey over their six licences in the Southern Porcupine over the course of the summer. This would bring the total seismic acquired in the Porcupine in 2016 to 9000km2, a significant increase on the previous record for the basin of 3,500km2 in 2013. Four of the licence awards are clustered around Shell’s Corrib gas field, opening up a new area of exploration interest. Two of these licence options were awarded to Europa, with Faroe and Predator picking up one licence each. Any future discovery here could benefit from being tied back to nearby infrastructure. Conoco sells Senegalese discovery blocks - fair price? Conoco's sale of its interests in Senegal can be used as a barometer of industry sentiment and as a yardstick on valuation of the assets. We believe the deal reached was a fair reflection of the value of the assets given the current environment, where the collapse in the oil price has lead to a re-evaluation within the industry. Conoco may have signalled its intent to sell the assets, but as a result this was an open process where all-comers could have bid. That should inform on a number of levels. Weaker market or more rational market?Companies have had a torrid time at the end of the cycle and a measure of past investment mistakes could be impairments/write-offs. If we take the financial results for the two participants in 2015, Woodside wrote-off US$1bn of assets (vs US$19bn of PPE) and COP wrote off US$3bn (of US$66bn PPE value). This pain should lead managements to be more conservative in future investment decisions. This conservatism means companies will be more stringent in investment decisions, and start to demand much higher returns if they are to improve on historically very poor full-cycle returns. This should be especially true given the uncertain future path for crude, and one where shale oil could place a cap on increasing prices. A more sober approach on asset valuation makes sense. The transaction is subject to government approval and pre-emption rights. Assessment of the value of the deal rests on a number of factors, not least the volumes used by the buyers/seller and the oil prices expected. Especially given the option to operate the development, we would expect commercial negotiations will have involved significantly more information exchange than the market has available, with Woodside's technical team assessing the data from the numerous wells and performing sensitivities over development concepts and timelines. As outside observers, however, we can only go on a limited number of data points. FAR and Cairn have given the market various data from which we can model the development and assess the value of the deal. SNE has had five wells drilled on the structure, with an independent evaluation of resources (via FAR) of 561mmboe at the 2C level (this has increased from original estimates of 154mmbbls pre-drill). Tests of the main reservoirs at SNE-2&3 showed commercial flow rates. FAN has had one well drilled in 2014 and has an estimated 950 mmboe of oil in place (P50). Given the lack of an appraisal campaign on FAN so far and the speed at which SNE is being chased, we would expect the vast bulk of the value in the deal to be in SNE. For simplicity, we therefore treat the FAN discovery as a free option at this point. Cairn have given an indication that first oil could be reached in 2021-2023, employing capex of $17-26/bbl and opex of $5-15/bbl. These estimates were given when the field size was 330 mmbbls, rather than the 561 mmbbls now given by FAR. We may expect that the per bbl figures may be lower for the larger field, though how the cost environment reacts over the next few years before FID is uncertain. We therefore assume the mid-case $/bbl figures for modelling, the result of which largely corresponds to Cairn's guidance on NPVs and IRRs given in its February 2016 presentation. Note that the figures below are given at FID, presumed to be in 2018/2019. We prefer to look at lifecycle development IRRs - after all, there is a great deal of spending before FID. If we look from 2016 in a $70/bbl long-term world, the project IRR is below 25%. Given the constriction of capital in exploration/development spending, especially given the uncertain cost and oil price future, we would expect that buyers would require relatively high base-case IRRs to enter projects to cushion them against headwinds such as project delays or cost overruns. This is borne out by this deal, where the base-case is well above the typical discount rate used by analysts. Using the 35% working interest sold by COP, and the $350m purchase price (paid in 2016), we find that WPL's IRR on its purchase is just above 16% (for the 330mmbl case) and just under 18% for the 561 mmbbls case. ***Update: using Cairn's recently released new guidance (mid-August 2016) on capex the IRR for the 473mmboe case is 21% for Woodside. Breakeven NPV10 is at a long term price of $45/bbl. Equity investors must now ask how high a return they should demand/assume if a large industry player with access to far greater levels of detail and potential operatorship demands 16-18-21%. We estimate COP's IRR on its investment as around 40%, although this is approximate given the confidential commercial terms in its original farm-in deals in 2013. We do know the carrying value as of May 2016 was $250m, and assume the US$80m adjustment fee is to adjust for capex spend in 2016 (the vast majority of which is on the drilling programme in H116). It seems that COP has achieved a good return on its investment, well above the project IRR, although COP (along with CNE and FAR) have borne the exploration risk to get to this stage. However, looking back at the return on capital if we account for the expenditures and risks of failure on original SNE and FAN wells, the deal probably doesn't make sense. This is probably not surprising given the deterioration in macro-environment since 2013 when COP entered the project. Tullow has announced it plans to raise $300m of convertible debt (maturing 12 July 2021, with an annual coupon of 5.875-6.625% paid semi-annually and convertible at 30-35% premium to VWAP on 6 July 2016). Given this proposed debt raise, it is worth re-examining the London-listed bonds for E&Ps and see how they have performed in recent months. Oil price volatility remains high with Brent crude having risen 17$/bbl or 51% since our latest published macro outlook in January 2016. Since then we have seen supply impacted by a 1.2mmbpd reduction in Canadian output due to wildfires, combined with underinvestment and instability- driven supply interruptions across OPEC members: Venezuela, Libya and Nigeria. Some of these temporary supply impacts will reverse over the coming months; nonetheless, we expect the oil market to tighten over the course of 2016. Although record levels of inventory and uncertainty over the sustainability of emerging market demand growth may limit near term price gains, longer term, we expect prices to rise to c.70$/bbl in-line with levels required to incentivise non-OPEC supply expansion. Our short term oil price assumptions remain aligned to EIA STEO forecasts at 43$/bbl Brent in 2016 and 52$/bbl in 2017. IEA short-term supply / demand forecasts point towards a market re-balancing over the course of 2016, with the agency’s base case forecasts suggesting just 0.18mmbpd of oversupply in Q416. Stress testing key assumptions including LTO (light tight oil, or US Shale) output, Iranian volumes and emerging market growth suggests that under all scenarios we should see a tighter market in 2H16 than in the first half of the year. The precise timing of the inflexion point at which we start to see sustained inventory draw-down is uncertain, and a slow-down in emerging market growth rates could push this tipping point well in to 2017. Given the volatility in the oil markets and considerable uncertainty to macroeconomic trends, we feel it prudent to align our short-term assumptions with that of the global agencies. We maintain our assumptions aligned to the latest EIA forecasts for Brent of $43/bbl in 2016 (from $40/bbl) and $52/bbl in 2017 (from $50/bbl). Implied volatility of future contracts remains exceptionally high with the December 2016 WTI contract implying a 95% confidence interval of 26.5$/bbl to 83$/bbl and 68% confidence interval of 35$/bbl to 63$/bbl. Break-even prices for marginal producers continue to fall after a c.15-25% reduction in 2015. Edison research indicates offshore projects can already be executed for full-field costs 20% below the levels of 2014, with further cost deflation expected in 2H16. Against this backdrop, we expect there will be a structural shift in the market to lower break-even prices in the short-term; however, cost-curves remain dynamic and we should start to see a shift back upwards if oil prices rise substantially, albeit with a lag. Assuming OPEC remains an observer rather than a price-setter, our approach remains to set our long-term oil price assumption around the economic return for marginal developments on the global supply curve; we maintain our long-term Brent assumption at $70/bbl. A Saudi-led OPEC market-share protectionist policy has driven a marked increase in inventories over 2015, providing a buffer against short-term supply shocks. A 1.2mmbpd reduction in Canadian output, during the latter part of May 2016, would have historically sent oil prices skyrocketing, but with OECD crude inventories 360mmbbls above their five year average, short-term supply-shocks are currently little cause for concern. Of greater significance are the longer-lasting impacts of underinvestment and instability across OPEC: Nigeria, Libya and Venezuela in particular. To date a combined 450kbod y/y decline in production amongst this group of three has played a significant role in offsetting the post-sanction increase in Iranian output. Flexing US LTO production and Iranian volumes by +/-200kbd from IEA base case forecasts and Chinese / Indian annual demand growth by +/- 1% we see a wide-range in potential implied crude stock change outcomes over the remainder of 2016 (exhibit 4) . Despite uncertainty, all scenarios suggest that the market is set to tighten over the remainder of 2016 which we believe will provide price support. Amongst the uncertainties, US LTO production in particular has proven to be exceptionally hard for analysts to forecast, this is despite leading indicators such as the Baker Hughes rig count. LTO production dynamics remain complex and are driven by numerous factors including well productivity, decline rates, wells drilled but un-completed, operator cash constraints and pace of service sector cost deflation. Investors should play close attention to the monthly EIA drilling productivity report in order to track the course of US LTO production over the course of 2016. In the long term, we expect global inventory levels to normalise, and OPEC spare capacity to remain below 3mmbpd (c.3% of demand), driving prices back up towards non-OPEC marginal cost. We maintain our long term oil price assumption at 70$/bbl Brent based on a normal return for a pre-FID project towards the top end of the cost curve. Estimates of the breakeven cost* for new developments have shifted over time, taking in to account new sources of supply (e.g. US LTO) combined with service sector cost deflation. The cost curve presented below uses a combination of company data on project breakevens and published cost curves from a range of industry sources. We have shifted our base case curve down to provide a broad-brush indication of the impact of further cost deflation over the course of 2016 assuming a further 5% reduction in breakeven for onshore projects, 10% for offshore and 15% for US LTO. *defined as the price at which a development generates zero return NPV(10%)=0.